Happy Sunday - I hope you all enjoyed your weekend! I had sometime this afternoon today play with this week's sketch at Freshly Made Sketches. 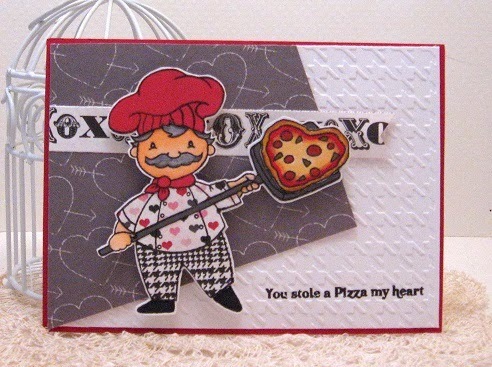 I just purchased this super cute stamp set from Sugar Pea Designs - Pizza my Heart, and I couldn't wait to ink it up! DP's from Echo Park/yours Truly and MME/Cupid's Arrow, cardstock from PTI, embossing folder from Lifetime Crafts. WOW!! Can't stop smiling...this is just adorable!! Love how you used the patterned paper for his oufit! Love this card - what a fun image and so beautifully colored and paper-pieced. Heart shaped pizzas - love it! Thanks so much for joining us at Freshly Made Sketches.